The bizarre, hourglass-shaped Kuiper belt object 2001QG298 spins round like a propeller as it orbits the Sun, according to an astronomer from Queens University Belfast. The discovery that the spinning object is tilted at nearly 90 degrees to the ecliptic plane was surprising, and suggests that this type of object could be very common in the Kuiper belt. The Kuiper belt objects (KBOs) orbit the sun beyond Neptune and are the best preserved leftovers of the formation of the planets. 2001QG298 is a remarkable KBO made up from two components that orbit each other very closely, possibly touching. "Imagine that you glue two eggs together tip to tip – that's approximately the shape of 2001QG298. It looks a bit like an hourglass," said Dr Pedro Lacerda at the Joint Meeting of the European Planetary Science Congress and the Division for Planetary Sciences in Nantes, France. The strange shape of 2001QG298 was uncovered by Dr Scott Sheppard and Prof David Jewitt in 2004. They noticed that 2001QG298's apparent brightness periodically tripled every 7 hours or so. "The object is so distant that we cannot resolve its shape. But this brightness oscillation, called a lightcurve, reveals the strange shape of 2001QG298 as it spins round. The object appears faint at times because one lobe is hidden behind the other, so less area is reflecting sunlight. As the hidden component rotates back into view, we can see the full hour-glass shape. The reflecting area increases and the whole thing looks brighter," explains Lacerda. However, Lacerda’s new study shows that 2001QG298's rotation is almost perpendicular to the plane of its orbit around the sun. Lacerda re-measured the object's lightcurve in late 2010 and noticed that it had changed from Sheppard and Jewitt’s observations. The lightcurve variation has become visibly shallower. “It was impossible to tell from the original observations if the rotation and the orbital plane of 2001QG298 were aligned or perpendicular i.e. whether the object spun round horizontally like the blades on a helicopter or rotated vertically like the propeller of an aeroplane. The changes to the lightcurve variation show that it must be approximately vertical. As 2001QG298 moves round in its orbit of The sun, our viewing geometry of the ‘propeller’ is gradually opening out from edge-on to seeing the whirling ‘blades’ full-face. This means that more of the reflecting surface is becoming visible at all times so the variation in the object’s brightness gradually disappears,” says Lacerda. The most important consequence of this finding is that it suggests that this type of double KBO could be very common. When in 2004 Sheppard and Jewitt found 2001QG298 in a sample of 34 KBOs they realised that they were fortunate to spot its binary nature – if it had not happened to be edge-on at the time of their observations, they would not have seen the extreme lightcurve variation. They estimated that approximately 10% of all KBOs are contact binaries, assuming that their tilts are random. "It was a surprise to find that 2001QG298 is inclined by 90 degrees, but that's not the first time we’ve seen this in a contact binary,” he speculates. 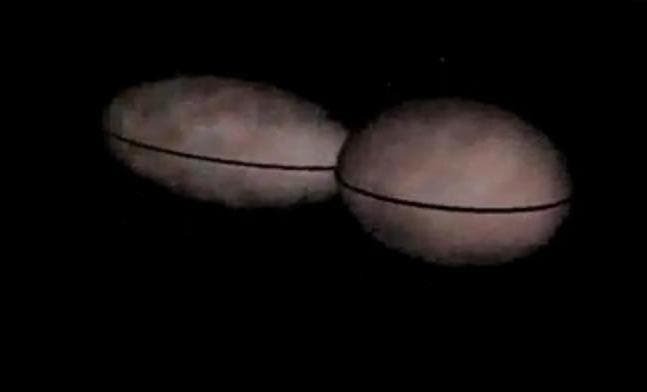 “There is another famous doublet object, a large Trojan asteroid called 624 Hektor. That object is also tilted almost 90 degrees." If contact binaries tend to be highly tilted then the chance of spotting their characteristic variable lightcurve is even smaller – only about twice per orbit. The identification of one in a small sample implies that contact binaries may be even more abundant than Sheppard and Jewitt first thought. Lacerda estimates that as many as 25% of KBOs are contact binaries. "If contact binaries do tend to be very inclined that may be telling us something about how these objects formed," concludes Lacerda.